The Dakar Rally shows no mercy, even to those gunning for a repeat victory. 2016 Dakar Rally motorcycle champion Toby Price’s race is over, reports NBC Sports. The Australian KTM rider fractured his left femur in a fall from his motorcycle. 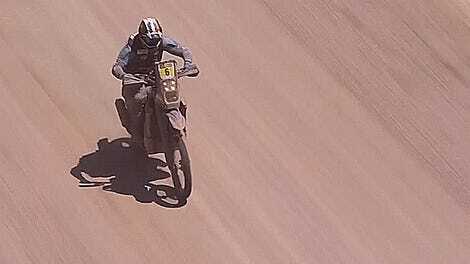 Per an update on the Dakar Rally live feed, Price’s fall happened several kilometers away from the end of today’s Stage 4 in Tupiza. Price was airlifted to the hospital following the fall. I stopped with him until the medical team told me that he wasn’t going to be able to continue. Health is the most important thing and I hope that he’s OK.
Walkner had a heartbreaking fall of his own in 2016, so he knows what it’s like to be stranded on a Dakar stage. Once again, Dakar proves itself to be one of the toughest, most dangerous rallies on the planet, with even those favored to win suffering the same risks and setbacks as everyone else.